The Cattlemaster is one of Metalcorp Steels most popular crushes. 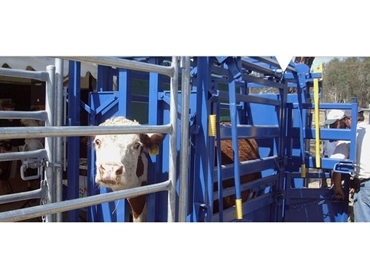 The genuine all rounder is suited to either dairy or beef cattle breeders where safety requirements for veterinary personnel are built in to enable continuous beast operation such as pregnancy testing. Included are split gates, an adjustable chin bar and a needling gate, with oval rail and high anti kick sheeted sides. Majority of the crushes work will be carried out on farms. Drop away handles can be adjusted in position and operated independently from front or back while other handle remains safely disengaged.